I spent more than two years of my life in this place called Bedok, Singapore. Everyday I used to come to the station to board a train to go to different places. It is one of the calmest neighborhoods in Singapore. Here in this photo, I am posing with the Varungaala America Janaadhipathy- my friend and jolly good fellow, Sendhil Kumar. There is never a dull moment when Sendhil is around. The highlight behind this picture is that this was clicked just seconds before I jumped into the MRT line and stopped the train with my little finger. If you are thinking that I am bluffing here, you have to check for this real news that came in Singapore news papers on Jan 10, 2010. 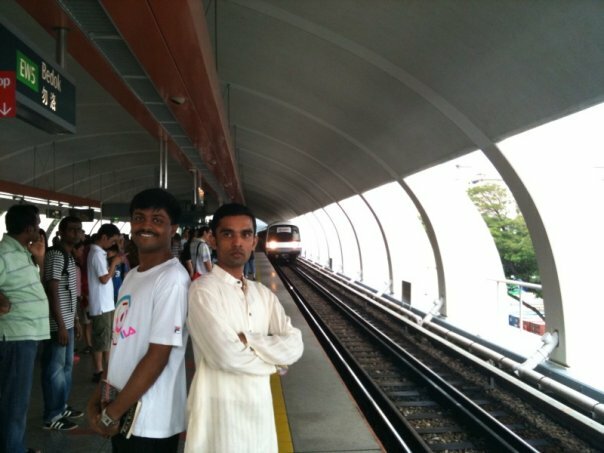 What I love about the MRT lines in Singapore is that people respect the yellow line in the platform. No one dares to cross that line. People respect rules religiously. Even when they enter the MRT, they stand in a queue and wait for their turn to walk in. Totally a different mentality from the local train life in Chennai. Here in Chennai, people enter the train from every possible hole. What scares most people in Chennai travel is not the crowd; but the manner in which one is treated by transgender people. I have nothing against transgenders. They are human beings too; but I don't like their attitude in train travel. I have been subjected to sexual abuse by transgenders in Chennai trains where they have grabbed by private parts when I refused to give them money. Some of them threaten for money; some of them touch people in a sensually ugly manner and make them part with their money and some even go to the extent of kissing people. I remember a train travel with my friend Rajesh (From Tambaram to Egmore). It was an era in which train travel was the much preferred travel mode for all youngsters, thanks to Alaipayudhey movie. Rajesh and I were standing near the door when a transgender (Let's call him Rose) entered the bogey and demanded money from us. Little did Rose know that Rajesh and my "sangam was going on in abaraadham". When we told that we did not have any money, the threatening started; but no one knew who Rajesh was. Rajesh was the kind of guy who does not have soodu or soranai (A trait that I have; but Rajesh was worse than me). When we did not give money, Rose started touching Rajesh inappropriately. Rajesh immediately started talking in Gaundamani voice and said " Ingey thodu, angey thodu" and started guiding Rose to touch him everywhere. This shocked everyone including me. All the scary tactics adopted by Rose went down the drain. So as a last resort Rose said that if we do not give money Rajesh will be kissed on the lips. But before anyone could react, Rajesh pounced on Rose and started smooching. Infact he almost bit the lips off. The next station arrived Rose escaped from Rajesh's grasp, jumped onto the platform and ran away. Even today when I see a transgender threatening people in train, I wish that Rajesh was there. There you go.... Ode to one (pitiful) Rajesh. Paavam Rajesh.